Lee Bethel intended to become an orthodontist. But instead of attending dental school, he received an education in sales the old-school way – by knocking on at least 20,000 doors by the time he received his bachelor’s degree in biology from Morehouse College in Atlanta. Bethel, the president of Comprehensive Benefit Services in Alexandria, Va., has been in the insurance and financial services world since graduating from Morehouse in 1978. The National African-American Insurance Association honored him in 2018 with its Lifetime Achievement Award. 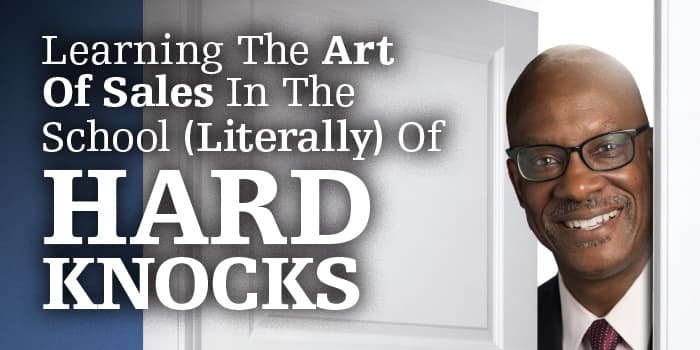 But despite his long career and numerous professional designations, he still draws on the lessons he learned from his summers spent selling books door to door as a college student. Southwestern Advantage, the company recruits and trains college students as independent contractors to sell Bibles and educational books directly to households. As part of their training, the students were required to read a number of books considered to be the classics of the sales library: Think And Grow Rich by Napoleon Hill, The Greatest Salesman In The World by Og Mandino and Acres Of Diamonds by Russell Conwell. The readings provided a good foundation for a sales education, but the real education came when the students hit the streets to sell the books. He had doors slammed and dogs chasing after him, among the many things to deal with while selling books. But while Bethel was looking ahead to dental school, his uncle had a different idea for him to consider. Ted Tillman was the second African-American agent hired by New York Life. He had a busy practice in Philadelphia but no one in his family was interested in taking it over. But Bethel never got the opportunity to work for his uncle. While Bethel was at home in Oklahoma City preparing to move, Ted Tillman died of a heart attack. But Bethel followed through on his plan to move to Philadelphia and join his uncle’s insurance business. He moved in with his aunt and started his career at the New York Life general office where his uncle had worked. He began studying for professional designations through The American College but he still needed help. “I didn’t know anything about the insurance business and I didn’t have my uncle to give me guidance. I needed to find someone for a mentor,” he said. After Bethel started working at New York Life, someone from the company approached his aunt, Betty Tillman, about entering the business as well. She took them up on the offer and worked for New York Life until she died in 2011. Betty Tillman met Dixon, an insurance professional who had been working with African-Americans who had been her late husband’s clients. Dixon offered to help her get started working with these clients and she did. While Betty Tillman was starting off in the insurance business, Bethel was at a crossroads and was thinking about moving back to Oklahoma City. Dixon was about 15 years older than Bethel and he was the mentor Bethel was looking for. “He had a high-end estate planning practice and I initially started off as the inside person,” Bethel said. “I did all the case preparation, prepared all the proposals, ordered the physicals, put the estate plans together. He did the fact-finding, I did the grunt work. Over a period of time, I started developing my own clientele. Bethel began to serve Morehouse graduates in the Washington, D.C. area. By 1985, he was spending more time there than than he was in Philadelphia. That prompted him to move to the Washington area permanently in 1987 and form Comprehensive Benefits Services. With Bethel serving the Washington area and Dixon continuing to work with Philadelphia clients, they built a thriving practice. After Dixon’s death, Bethel decided to close the Philadelphia office although he continues to serve clients there. His current office is near the intersection of the Capital Beltway and Interstate 95, close to Washington and its suburbs and a relatively easy trip to Philadelphia. Comprehensive Benefit Services has a client base of small-business owners who have anywhere from two to 700 employees. The company focuses on 401(k) and 403(b) accounts as well as a full range of employee benefits, insurance, investments and wealth management services. 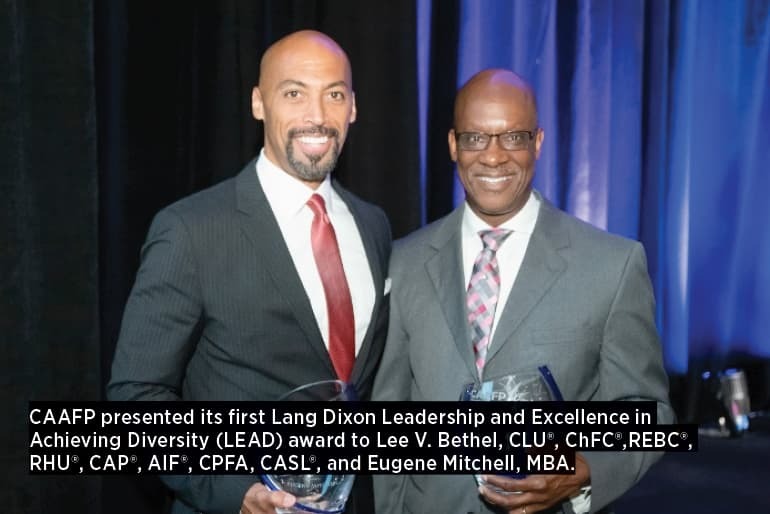 Dixon’s memory lives on with Lang Dixon Day, a time of education and networking for African-Americans in the insurance and financial services business. The event is the work of The American College’s African-American Advisory Committee, which Bethel has chaired. Lang Dixon Day is in its 13th year and the most recent event attracted 550 attendees, Bethel said. Bethel understands his three daughters aren’t interested in joining the insurance business. So he is coming to terms with the fact that he needs to find someone to bring into the practice much as Dixon did with him. “I need to be Lang Dixon and find another Lee Bethel,” he said. In the meantime, Bethel is still employing many of the habits he learned when he knocked on doors as a college student. Tell Us! Do you know someone who would make a compelling profile story? Shoot us a quick email telling us who it is and why you think so. Send it to [email protected], and put PROFILE in the subject line.